David Kopel's business case study, Jerry Kopel Cares: An Analysis of the Marketing and Organizational Techniques in Gerald Kopel's 1978 Campaign. In 1976, Kopel was upset by Republican challenger Paul Swalm. Kopel had to reinvent his political campaign style in order to face Swalm again in 1978. Full list of Jerry's articles, on this website. Colorado Politics & elections, including Denver. Constitutional Amendments and other Ballot issues. Most of the articles on this website were originally published in the Colorado Statesman, Colorado's weekly political newspaper. Jerry Kopel's column, which ran from 1992 to 2012, won 7 public service awards from the Colorado Press Association. The Gerald Kopel Papers, which cover Kopel's entire legislative career from 1964 to 1992, are housed in the Denver Public Library's Western History Collection. The papers are perhaps the most extensive archive of the public career of any American state legislator from the 20th century. For more information on the collection, and a link to an HTML table of contents, click here. For the Denver Public Library's online Table of Contents and information, click here. Jerry Kopel's Report. Jerry's newsletter to constituents, from 1967 to 1998. Available in the Denver Public Library. The Dolores Kopel Papers, cover the life and career of Jerry's wife Dolores, who was one of the first female lawyers in Colorado. She served as United States Bankruptcy Trustee for Colorado and Kansas. Table of Contents here. Short biography of Dolores Kopel. Reported legal cases of Gerald and Dolores Kopel. Chris Leppek, Reliving the glory days, Intermountain Jewish News. Oct. 1, 2009. Article on the successful campaign by Colorado legislators Jerry Kopel and Tilman Bishop to free the Leningrad Three. Boston Globe story of ceremony honoring Rep. Jerry Kopel and Sen. Tilman Bishop: Hinda Mandell, Cry of liberty. Foundation will honor refuseniks whose 1970 attempted hijacking drew world attention to the Soviet Union’s oppression of Jews. Boston Globe, Oct. 8, 2009. Jerry Kopel, Freeing the Leningrad Three. Adopted March 21, 2012. Video of the day's House session is here. Audio file, in mp3. The Memorial begins at 12:49 and ends at 1:23:30. Former Representatives: Ruth Wright (Minority Leader), David Skaggs (Minority Leader, U.S. Rep.), Wellington Webb (Mayor of Denver), Dorothy Rupert (State Senator), Barbara Holme (State Senator), Phil Hernandez, Bill Owens (Governor), Bill Thiebaut (Senate Majority Leader; Pueblo District Attorney), Bob Allen (Majority Leader), J.D. McFarlane (Colo. Attorney General), Dennis Gallagher (Denver City Auditor). Rep. Matt Jones, concluding remarks. Denver Post coverage of the Memorial, by Lynn Bartels. A Republican governor and a Democratic congressman honor the late Jerry Kopel. Includes full text of the House Memorial Resolution. Mar. 21, 2012. Colorado Statesman coverage, by Peter Marcus. Jerry Kopel, a "legislator's legislator," remembered fondly by his colleagues. Mar. 23, 2012. Held at the Denver Botanic Gardens, Feb. 4, 2012. Video file (in .mp4). Audio file (in .wav) of the Celebration. Program: Opening remarks by Master of Ceremonies Dennis Gallagher. Reading of a letter from Regent Tilman Bishop. Jerry's grandchildren Kathleen, Margaret, and Andrew. Note: The audio starts with Gallagher's introduce of Rep. Webb. Total runtime is for video is 57 minutes, audio is 34:30. Jerry Kopel passed away peacefully on January 21, 2012. He had been seriously ill for a while, and was definitely ready to move onward. While our family misses him, we are happy that his spirit has been liberated from the maladies of his body. Persons who would like to make a gift in Jerry's memory are encouraged to donate to the Denver Public Library. Page 2 of the online donation form will give you the opportunity in the Comments field to make the donation a Memorial for Jerry Kopel. The funds will be used to support the Western History Collection at the Library, which is the repository of Jerry's papers. Colorado Bar Association resolution honoring Gerald H. "Jerry Kopel. "Mr. Colorado Legislature" inspired awe. Pueblo Chieftain. By Tom McAvoy. Jan. 29, 2012. Former Colorado lawmaker Gerald Kopel remembered for love of state. Denver Post. By Tim McGhee. Jan. 23, 2012. Former state Rep. Jerry Kopel passes away. Colorado Statesman. Jan. 23, 2012. Jerry Kopel, the Legislator's Legislator. By Morgan Smith. Colorado Statesman. Sept. 27, 2011. Prepping Legislators. By Dennis Gallagher, Accountability and other matters. Nov. 30, 2010. U.S. Rep. Diana DeGette (D-Denver). Remarks in the Congressional Record, "Celebrating 80th Birthday Of Gerald (Jerry) Kopel And 56th Anniversary of Jerry And Dolores Kopel." June 12, 2008 (pages E1229-30). Text. PDF. This 2015 book is now available from Amazon (electronic). Review from 5280 magazine: A Local Guide to Being a Nicer, Better Politician. Review from State Legislatures, the magazine of the National Conference of State Legislators. Based on more than half a century of experience in the Colorado General Assembly, "Rules for State Legislators" is a guide to being a more effective state legislator. The book offers advice on dozens of topics--including where to sit, how to pass bills when you're in the minority part, rescuing your bill from conference committee, and content of your newsletter for constituents. 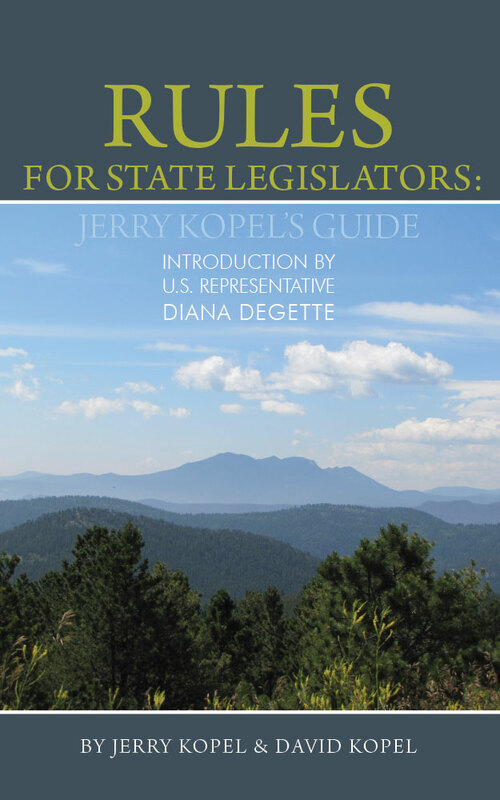 "Rules for State Legislators" also provides stories of Colorado's political history, including the long battle for statehood, women's suffrage and first female legislators, and how the Vietnam War cost a 20-year U.S. Representative his seat. The Martin Luther King holiday for 1993 has come and gone and not too many people remember the trauma of getting the measure passed in 1984. Certainly Wilma Webb, the chief sponsor of HB 1201, does. About a year ago, then-Rep. Webb opened her wallet, pulled out a small slip paper on which three words written, and showed it to me. The paper was slightly worn, but I remembered what happened on March 25, 1984, and how knowledge of the Rules of the Colorado House helped make success for the King Holiday finally possible. In 1984, Colorado had reached the point when something regarding a King Holiday was going to happen. There were two camps in the House: those who supported Rep. Webb's position that the state declare the holiday legislatively, and those who supported then-Speaker Bledsoe's position that the issue should be placed on the November 1984 ballot as a statute referred to the voters for a decision. In the committee of the whole on February 22, 1984, the Bledsoe position was defeated; but in the report of the committee of the whole, an amendment was offered by Rep. Bill Artist to have the issue decided in the November election. The Artist amendment passed 33-32. Who says one vote doesn't count? If the leadership position held, the measure would go to conference committee to resolve the difference tween the two houses. Although Representative Webb would be on the conference committee, the other two House members would not be friends of her position on the referral. And the rules require two members of each house on the conference committee to approve the committee report. On the day before the issue is to be debated in the House, Rep. Webb posed the issue to me: Whatever motion was voted on would be the one that would pass the house. How can she ensure that vote would be on her motion to concur in the Senate amendment? The normal procedure would be for her, as chief sponsor of the bill, to make a motion to concur. Then someone from the opposite camp would make a substitute motion for conference committee. We probably would have a measure on the ballot in November, because the majority the House members did not want to be seen as having voted "against" a motion on the bill, which could be interpreted by election opponents as being totally against the holiday. I suggested a strategy. There is nothing in the rules to prevent her from making a series of motions and deciding the order of voting. She would be recognized by the Speaker. Her motion would be to adhere to the House position and reject the Senate amendment. After such a motion, she would be recognized to speak on the motion. When recognized again, she would make a motion for a conference committee. Rep. Webb was recognized by the Speaker. She made a motion to reject the Senate amendment and to adhere to the House position. Democratic House members from their seats called out: "No, Wilma, that's wrong." Legislators turned to each other and asked, "Why did she do that?" Rep. Webb raised her hand, and the Speaker recognized her. Everyone expected her to now explain. Instead she said: "Mr. Speaker, I move the House reject the Senate amendment and request a conference committee." The House became quiet. Checkmate occurred whether or not Rep. Webb would be the one to make the final motion. She raised her hand again, and was recognized. "Mr. Speaker, I move the House concur in the Senate amendment." The motion passed 38-26 and the bill was readopted by a vote of 38-26. The House Journal for that day would listed only 2 of the 3 motions Rep. Webb made (conference and concurrence), but the House tape has all three motions. I have no doubt that putting the issue on the ballot 1984 would have resulted in defeat. I believe only two states have supported the King holiday by way of election. The year 1984 was conservative landslide. After election day, there were only 18 Democrats in the House and 11 in the Senate, the lowest number in 38 years. The moral of the story? Learn your rulebook. You never know what can be used to defeat into victory.